Having overseen events where we had to cater for thousands, making sure that no one went home hungry, I can see how the possibility of feeding five thousand in today’s gospel reading would be any caterer’s nightmare. Thankfully, we Asians are in the habit of always cooking and serving up more. Yet, it’s hard to comprehend how Jesus and his disciples could resolve the issue of feeding five thousand on a meagre meal of five barley loaves and two fish. It would be a Herculean task by any measure. No wonder the Apostle Philip exclaimed, “five barley loaves and two fish, but what is that between so many?” How do you match the immensity that is experienced with the insufficiency that is expressed? But we need to remember that in the economy of the Kingdom, these things cannot be reduced to a formula of figures. The juxtaposition of a situation of cosmic proportions with that of meagre, insignificant even miniscule resources is deliberate. It not only heightens the narrative, but also sets the stage for what is going to be revealed. All four gospels relate the episode of the feeding of the multitudes by Jesus, but only the fourth evangelist called it a sign (Greek, semeion). Each sign should be understood as a vehicle of revelation and a personal encounter with Jesus as Lord. In each sign, a challenge is issued; those who witness the sign are summoned to go beyond the sign and to believe in the One whom the sigh has revealed. 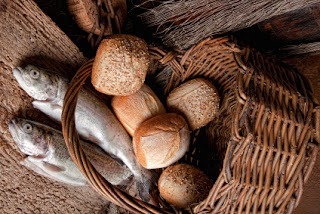 Today’s gospel, the real focus of the miracle is not the five loaves or the two fish, nor is it the multitude who is fed, but Jesus Himself, Jesus who is both the Bread and the Bread-Giver of Life of the World. The story certainly points to more than an ordinary miracle involving multiplication of food. It ultimately points to the Eucharist, which in turns point to the messianic banquet in heaven. The enormous dilemma awaiting a solution all speaks to us about immensity, about abundance: not the kind of abundance that comes from careful gathering and accounting; but the abundance of God's providence. ‘Looking up, Jesus saw the crowd...’ (v 5). It seems St John the Evangelist wants us too to lift up our eyes, he wishes to draw our attention to view things not only as they are but what they could be. We are given a glimpse of the heavenly banquet. Just as the disciples and the crowds were invited not to live their earthly lives by addition and subtraction, we too are invited and challenged to live our lives according to the economy of heaven. As Jesus lifted up his eyes to look at the crowds, we the audience are invited to lift our eyes to look at Him and to see what is happening. Of course, our attention goes immediately to the impossibility of the situation. We see the five thousand and we see the five loaves and two fish. “What is that between so many?” Contrasted with the immensity of everything in that scene is the poverty of resources. The figures just don’t match. You can smell the despair that hangs in the air and perhaps be drawn to it (if not for our familiarity with the gospel story and its conclusion). It wouldn’t take long for even the most optimistic person to conclude that it simply couldn’t be done. Despair sets in whenever we are unable to see beyond the problem. Four sorts of despair often affect us as they would have affected the disciples. Each one blinds us to the reality that Christ is present, He is control, and nothing is impossible for Him. First, they despaired over what they didn’t have. Philip quickly sized up the crowd and said that it couldn’t be done financially. They just didn’t have the money to do what Jesus was suggesting. And even if they did, there weren’t enough stores and markets in tiny Bethsaida to buy the goods. Second, they despaired over what they did have. All they had was the lunch that a little boy had brought, nothing more than the ancient equivalent to a “Happy Meal”. Third, they even despaired over the humble nature of what little they had. It wasn’t just five loaves and two fish, but, as John tells us, it was five “barley” loaves and two “small” fish. Barley loaves were pretty poor things to offer to people and was usually reserved only as animal feed. And the word used to describe the fishes is one that refers to a tiny fish that you eat whole, in a single bite. It was a pauper’s meal. And finally, they despaired over the enormity of the task. In a deserted place, at this late hour, how could they possibly find sufficient food for the massive crowd. As a result, the disciples clearly didn’t want anything to do with this problem. And on a purely human level, who could have blamed them? The situation was humanly impossible. Miracles seem to happen in situations of scarcity rather than plenty. Why? Because where there is plenty there is no need of miracles! Where there is plenty you don't have to struggle, you don't have to come up against realities too painfully, you ease your way through everything with a cheque-book. It is the poor, the desperately helpless one, the one who has exhausted all options and used up all resources or had nothing to begin with, who will recognise the power and blessedness of God’s intervention. At every mass, let us not miss the miracle that is taking place on the altar of sacrifice. Let our eyes, our thoughts, our visions not be fixed on whatever issue or problem that may be weighing us down. Rather, let us look up, beyond the multitude, beyond the measly five loaves and two fish, beyond the problem that weighs us down, to see the miracle of Jesus. Ordinary bread and wine are changed into the Body and Blood of Christ. Ordinary food that satisfies our hunger now becomes the elixir of immortality and the antidote to death. At every mass, the tiny host, so small that it seems lost in the cup of our hands, veils the Thrice Holy, Omnipotent, Almighty God who Created the Universe. Here is the Bread of Life. Here is the Son of God. Here is our Saviour, who deigns to feed us with his own flesh. Here is the foundation of our Hope, in Him we shall never despair!